We don t add a 21% more to pay when you finalize your booking !!! Free coffee and tea all day ! Vincent and Gilda invite you to have the best stay in town offering their house ! They met in 2009 and together decided to create this hostel. Vincent,a french now installed in Argentina, will offer you his experience as a traveller and Gilda will help you to discover her native place. 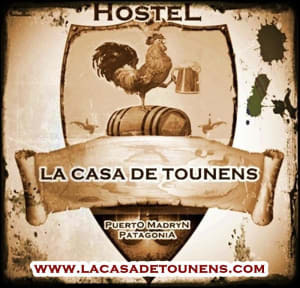 La Casa de Tounens, more than just a hostel, it is a place to meet other travellers and share experiences. The house has 5 rooms for a 16 to 20 beds capacity. We offer the breakfast and let the kitchen if you need to cook. To enjoy your meals or just rest, you'll find a living room, a tv room with cable and dvd and an other room with computers. We can also help you to organize your stay in Puerto Madryn. You'll find in our website all the information you'll need. For more options like SINGLE , 3 or 4 people rooms, you can also contact us. Recommended! Vincent is lovely and super accommodating. I missed my bus into PM and he happily changed my booking. Only a few blocks from the beach, one block from the supermarket and bus station. Really safe, wifi is decent and kitchen has everything you need. We had the best time in this hostel. The owner is super friendly and helpfull! I would advise this hostel to anyone!! Very nice and helpful owner! He organised us people to share our car with so it git cheaper! Always helpful and friendly, great and big rooms. Really enjoyed to stay there. Close to the bus station. Good and nutricious breakfast with selfmade bread ☺️ totally recommand!! A bit old looking but all in all a very nice place. No wifi in the room outside. Nice hostel very near the bus station and at walkable distance from the city center. The room was clean and big. Vincent is a very nice person and he gave us useful advice on the excursion and restaurants. A great hostel with lovely people and a fab atmosphere. Not the best room but made up for it for being a great place to hang out and meet other travelers. Comfortable, pretty clean, cozy with green backyard and definitely perfect location. Nothing really special, but nice place to stay for couple of days. Tip: if you come there for the nature and don't want to spend tons of money - do research of the opportunities by yourself. The stuff mostly advice different tours and don't give a lot of info about it. Had a great time at this hostel. Lovely breakfast with homemade bread. Vincent was very helpful throughout our whole stay. Quiet, but decent atmosphere to meet others. Also clean and very secure. Very close to bus station which was useful. Helpful staff. Bathroom a little grubby. Nice breakfast. For some reason it’s almost impossible to unlock the gate though! !